Fluence’s innovative MABR wastewater treatment solutions embody the criteria of Frost & Sullivan’s Company of the Year Award: Visionary Innovation & Performance and Customer Impact. To receive the Company of the Year Award […] requires a company to demonstrate excellence in growth, innovation, and leadership. This kind of excellence typically translates into superior performance in three key areas: demand generation, brand development, and competitive positioning. These areas serve as the foundation of a company’s future success and prepare it to deliver on the two criteria that define the Company of the Year Award (Visionary Innovation & Performance and Customer Impact). Frost & Sullivan hailed many of Fluence’s strides in several areas of operation, but spotlighted the disruptive decentralized treatment strategies that are currently changing the trajectory of the water treatment industry. Considering global escalation in urbanization and the growth of industry and business, Frost & Sullivan noted that centralized wastewater treatment isn’t always up to treating all wastewater generated or managing the supply of treated water. Although Fluence is highly diversified within the industry, its innovative containerized product lines were created specifically for water treatment’s decentralized future. Fluence has engineered revolutionary technology into much smaller and smarter packages, thus widening access to an exponentially larger market. The company’s breakthrough was the roll-out of its containerized NIROBOX™ desalination plants and EcoBox™ water reuse plants, which package state-of-the-art water treatment into standard shipping containers that can be transported directly to the source of generation or demand. [D]ecentralized water and wastewater treatment (WWWT) centers are a better value for money, easier to maintain, and more environmentally friendly than centralized systems. By decentralizing WWWTs, companies avoid having to lay miles worth of pipeline and building massive infrastructures to pump water and wastewater. Fluence hasn’t stopped at engineering treatments into containers, but has also improved the treatment process with new technology. Frost & Sullivan singled out Fluence’s patented membrane aerated biofilm reactor (MABR) technology for praise. Fluence MABR modules use an air-permeable membrane that packs a large surface area into a cylindrical tank by winding it like a roll of paper. Fluence MABR modules are more efficient than other configurations. The membranes form an envelope of air that feeds aerobic digestion of the surrounding mixed liquor. A nitrifying biofilm that forms on the membrane allows for simultaneous nitrification-denitrification, so one tank does double duty. Perhaps most importantly, because the aeration doesn’t require pressurized air, the energy requirement for aeration is slashed by 90%. This reduction means that plants can be operated by solar energy in areas off the electrical grid. The Nirobox line of containerized desalination and freshwater treatment products was next in line for praise. The Nirobox shares the virtues of its Fluence wastewater treatment sibling products: It is packaged, containerized, modular, scalable, easily installed on a small footprint with little site preparation, and offers short intervals between order and install. With water scarcity intensifying around the world, Nirobox offers an ideal solution for delivering clean water to small communities and remote areas. But developed countries also are discovering the virtues of using modular systems instead of building multibillion-dollar plants, which can take years to construct and saddle taxpayers with debt. Small, containerized Nirobox units can be brought in to ease water shortages and can be used in tandem to match capacity needs. Once a shortage ends, one or more units can be decommissioned and transported elsewhere as needed with minimal waste of assets. Next, Frost & Sullivan singled out Fluence’s SmartAerator™ TORNADO®. Fluence is committed to a future where smart technology maximizes efficiency. The SmartAerator is sold in tandem with Tornado aerators, or can be used to retrofit existing Tornados. SmartAerator’s sensors and controls can provide energy savings of 50% over Tornado aerators alone. The institute pointed out that Fluence views its sales as long-term partnerships and remains closely involved with client operations, viewing each treatment scenario as unique and worthy of attention to detailed customization. 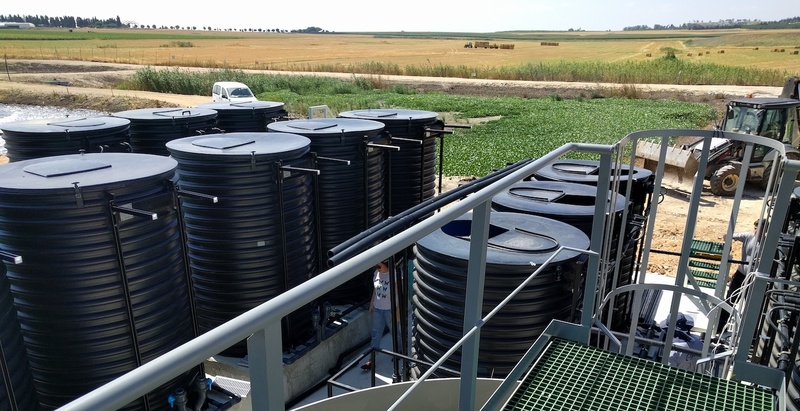 Providing excellence in water treatment is a long-term process and Fluence remains an integral part of its products after sale and installation. The report took notice of Fluence’s banner year of 2017, citing last year’s merger of RWL Water with Emefcy to create Fluence. Frost & Sullivan highlighted Fluence’s inroads in South America, noting its operation contract for a new ultrafiltration plant in Argentina, and a 22,000 L3/d, $44 million build-operate-transfer (BOT) facility in Mexico. China is a particular area of interest for Fluence. Although decentralized water treatment has been shown to be superior in many treatment scenarios, national and regional governments have in many cases hesitated to embrace a concept so radically different from the traditional water treatment paradigm of centralized plants. But, the country’s latest five-year plan emphasizes sustainable technology, rural infrastructure, and surface water remediation, creating a niche for Fluence’s decentralized solutions. Fluence has developed strategic partnerships in China, signing a framework agreement with Jiangsu Jinzi Environmental Science and Technology Company (Jinzi) to deliver six smart, packaged MABR wastewater treatment plants, and entering a binding agreement with Qingshuiyuan Environmental Company (QSY) to design, build and operate a commercial MABR smart packaged plant in Henan Province, part of a broader cooperation agreement between Fluence and QSY covering three provinces. While typical decentralized water treatment systems are relatively expensive, complicated, and inefficient, Fluence Corporation leverages innovative and smart technology solutions backed by decades of industrial know-how to excel in water and wastewater treatment solutions. Fluence’s excellence becomes apparent through its success, as the company continues to expand its existing offerings as well as partnerships with other prominent companies in the industry. With its easy to use, sustainable, smart and cost-effective solutions as well as a remarkable year of growth, innovation, and leadership, Fluence Corporation earns Frost & Sullivan’s 2018 Global Company of the Year Award in the decentralized water and wastewater treatment industry.